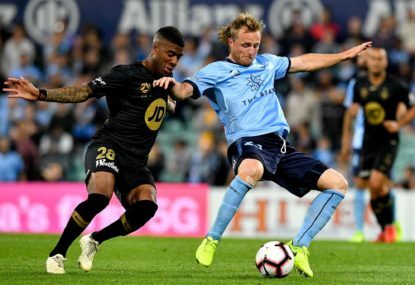 Goalkeeper Andrew Redmayne has again come to the rescue of Sydney FC after denying Riley McGree from the penalty spot in their 2-0 A-League win over Melbourne City. The Sky Blues appeared on their way to a draw on Sunday when Bart Schenkeveld convinced the referee that he’d been brought down in the box in the 78th minute. 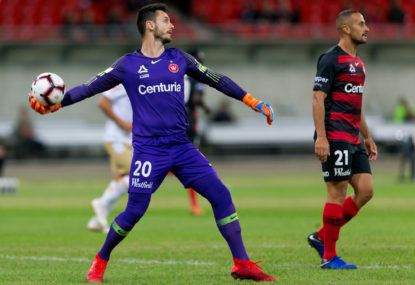 But for the third time this season, Redmayne’s antics on the goalline paid off as he produced a legs save, to the delight of the 13,029 Jubilee Stadium crowd. Redmayne also denied a Rostyn Griffiths’ driving shot in the 59th minute. Adam Le Fondre sealed the win in the 86th minute, ending a four-game goal drought by going through the legs of Eugene Galekovic. His 12th goal means he retains his spot as the league’s leading scorer. More importantly, the win ensures Sydney FC remain in third spot, one point behind Melbourne Victory and five from league leaders Perth. It was a measured performance on Sunday evening from the hosts, who had their backs to the wall for most of the second half after Luke Ivanovic’s early opener. City looked bereft of a finisher. They will welcome next week’s arrival of Socceroos representative Jamie Maclaren. Warren Joyce’s side stay in fifth spot, one point ahead of Wellington. The humid conditions meant both teams settled on a slower pace, which appeared to suit a Sky Blues side ready to pounce on their moments. And after impressing last week, Ivanovic who took his first chance, showing good touch off a Milos Ninkovic pass and side-footing under Galekovic. A minute later, the Sky Blues’ youngster copped a high boot to the face from Harrison Delbridge, which resulted in a yellow card. Ivanovic’s afternoon ended when he limped off with a possible glute issue. 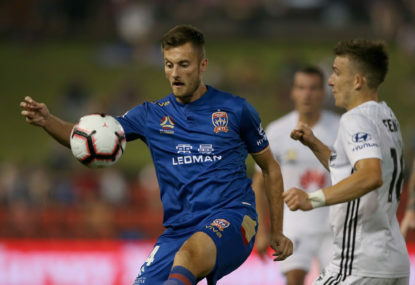 His goal allowed the home side to put the squeeze on their opponents, with Lachlan Wales’ audacious shot with the outside of his boot their best chance. With the wind behind their backs in the second half, City enjoyed a host of possession but struggled to convert their dominance into opportunities. In contrast, the Sky Blues had a handful of looks at goal, most notably when rusty midweek signing Mitch Austin had an open net, but could only find woodwork. I love the notion of a ‘sure thing’. Nothing tingles the hairs on the back of the neck like a friend leaning in a little closer and whispering some ‘secret’ information into my ear. With just four weeks remaining of A-League home-and-away play the top six looks set. 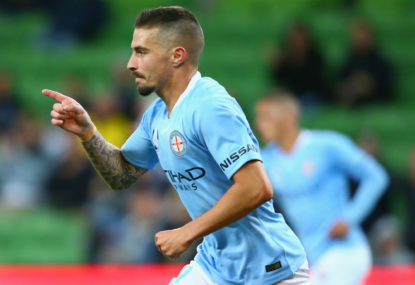 Jamie Maclaren is likely to return from concussion next week with Melbourne City needing his striking to galvanise them in the run to the A-League finals. 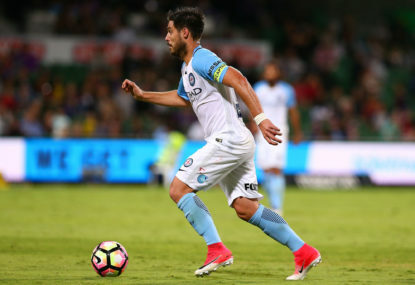 Perth Glory have confirmed the signature of Uruguayan striker Bruno Fornaroli for the next two A-League seasons, ending his troubled tenure at Melbourne City. 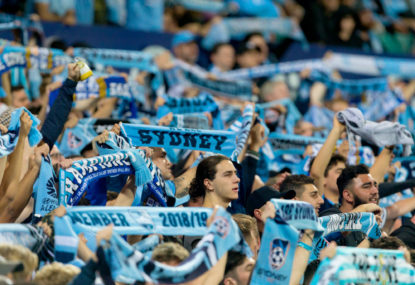 Sydney FC will be welcoming back the Leichhardt Oval after a tricky game in Japan.